Summer is upon those of us who happen to live in the northern hemisphere, and it is a time of movie blockbusters, plenty of time spent by the beaches to get a tan, as well as jet setting across the world for a holiday to take a much deserved break from all the hard work that you have indulged in at the office over the past year. Well, what happens when you do not have the financial means to fly halfway around the world? There is always an alternative, and that would be to invite the rest of your family and friends over for some outdoor BBQ fun at your place, and to sleep under the starry skies after that. Without having to splurge on stays for everyone in a 5-star hotel, how about settling for the £1,999.99 London Underground Tube Tent? 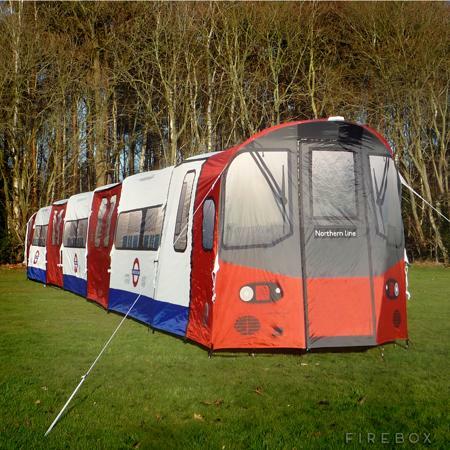 This is a unique representation of an indefinite extension of the Northern Line, as the London Underground Tube Tent is capable of pack in a whopping 72 people at a stretch, where it can also let you sleep 16 folks comfortably over five different compartments, making it the perfect option for parties, large-scale camping and epic sleep overs. Since there are no pesky inspectors around to maintain the law and order, you and your merry gang can be as rowdy as you like, and literally party all night long.